2011 Ohio State Trailer 2: Shock The World! After remembering the past and the legacy that brought us here, it’s time to get excited about the 2011-12 Ohio State season. Who knows how the things that start today at the practice facilities will end up in November and beyond, but it certain that this team has one vision and one purpose. Stay tuned to tBBC for weekly looks at the top plays of the Ohio State season, and be sure to follow me on twitter: @RobbyDKitchel If you find yourself in the Columbus (Mississippi) area, you can also catch me on WCBI Sports. We begin the 2011 Ohio State Movie Trailer series by paying tribute to one of the greatest coaches in Buckeye history, who revolutionized the program. This year, the Buckeyes will be playing under new leadership, but there’s no doubting who they will want to win for this season. The 2nd Installment will be released Monday, August 8th. Until then, keep it locked here on tBBC and follow me on Twitter for more on the 2011 Ohio State Movie Trailer series! The 2nd of however many articles I will publish on the 2011 Spring Game focuses on the offensive side of the ball, which if you haven’t noticed has some positives and negatives going into next season. On our first look at the 2011 Spring Game, we dissected each of the 4 QB’s and how they looked out on their possessions. This time, we will look at the offense as a whole, position by position. There’s no doubt about it, the backs are going to be Ohio State’s strong suit going into 2011. With all of the talent, speed, and power at the tailback position, offensive coordinator Jim Bollman is going to have one heck of a time trying to figure out who his #1 will be. And to be quite honest, he may not need to name one for the first 5 games. 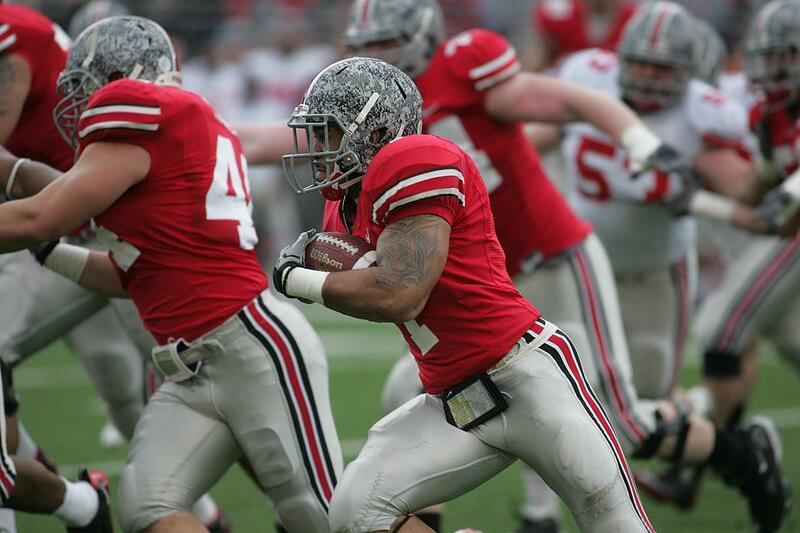 Let’s be straight here: after watching the spring game, Boom Herron is OSU’s #1 back once he returns from suspension. His combination of speed, power, and patience carrying the ball is by far the best on the team. I’ve heard from many Buckeye fans that they don’t want to see Herron as the feature back of this offense. Those fans were served a dose of humble pie as Herron looked excellent breaking tackles, waiting for his blocks, and fighting for extra yardage. Not to mention, we saw a little bit of his speed shine as well. Outside of Boom being #1, it’s a dead heat for who’s going to be the #2. That means the #1 for the first 5 is not an easy decision to be made. And who knows, maybe there won’t be a #1 back on this team going into the non-conference slate. Go back to the ’03 team that had Lydell Ross and Maurice Hall. While Ross may have the so-called ‘starting running back’, they shared the bulk of the carries. That could be the same situation heading into the home opener this year. 44,276 may have seen a glimpse of what the future/the first 5 holds for Ohio State at this year’s Spring Game, which the Scarlet (offense) dominated the Gray (Defense) 59 to 27. The score line makes it seem like the offense was the juggernaut of the 2 sides, but honestly both teams had their moments and the defense captured some life as they harassed all 4 QB’s at some point during the game. In this recap, we’ll focus JUST on the QB’s, since that appears to be the big talking point going into the 2011 season. So who will start in the first 5 games without TP? Let’s take a look.